We’re expecting SRD officials to show up in force tomorrow to try to evict the protesters. 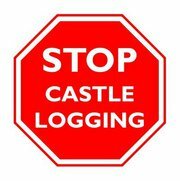 Please call Premier Redford’s office, and let her know that you are opposed to both this action and to clear-cut logging in the Castle. And, if you can get to the protest site tomorrow, we could use some help. See http://www.pinchercreekvoice.com/2012/01/castle-logging-protesters-recieve.html#more for a story about today’s events. For 13 days citizens have braved the cold to protest against plans by Spray Lake Sawmills (SLS) to clear-cut log in the Castle area, southwest of Beaver Mines, Alberta. Today, Monday January 23, a large number of Sustainable Resource Development (SRD) Officers and SLS employees and contractors were seen meeting on a side road in Beaver Mines. Late in the day, SRD officers arrived at the protest site to serve a “Trespasser Declaration” which says that the tents that have been part of the protest are now “property of the Crown”. Given the Trespasser Declaration and the large number of SRD and SLS staff and contractors in the area, the protesters expect to be visited by SRD officers in the morning of Tuesday, January 24. Officers may try to evict the protesters. It’s not known what time the officers might arrive, but it’s likely to be between 8:30 and 10:00 am. Despite public opinion polls showing that more than three quarters of regional residents are opposed, clear cut logging in the Castle Special Management area near Beaver Mines is about to begin. The proposed logging will not only be detrimental to the watershed, wildlife, recreational opportunities, and area wilderness-based businesses, but will be an eyesore to everyone that drives to the Castle Mountain Ski area. Experts on grizzly bears and watershed health have spoken out against the logging, citing irreversible effects on ecosystem function and wildlife habitat quality. Local wilderness-based businesses are concerned that the proposed logging will damage their business opportunities. Citizens are having a hard time understanding why, after thousands of opposition e-mails, five rallies and protests across Southern Alberta, hundreds of letters and phone calls, and numerous meetings with government officials, the government insists on proceeding with this unwanted and ill-advised logging. Citizens are not convinced by SRD’s economic or scientific justifications for the logging. Rather, it’s commonly believed that the real reasons for the clear cutting are 1. welfare logging, and 2. turf protection on the part of SRD. Local residents feel that SLS and Alberta Sustainable Resource Development have chosen a place to begin logging that will act as a “poke in the eye” to the public. This entry was posted on Tuesday, January 24th, 2012 at 12:12 am and is filed under Uncategorized. You can follow any responses to this entry through the RSS 2.0 feed. You can leave a response, or trackback from your own site. I phoned the Premier’s office again today along with several letters.